The picture shows a street artist next to the old town portico. 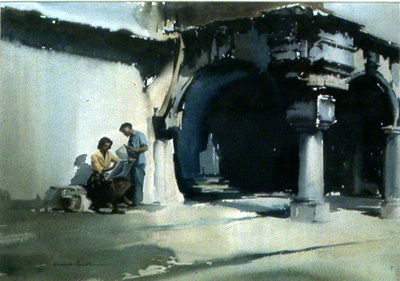 The artist has picked out the stone columns as a backdrop to the paintings subject matter. Claude Buckle skilfully paints in the stone work columns to balance the pictures main theme. Skilful use of water colour medium is demonstrated in this picture. Created in 1971. 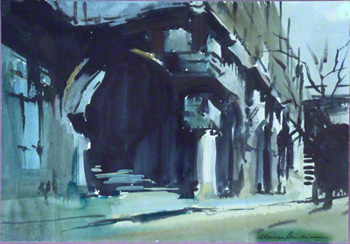 Sketch showing the portico used in the painting above. The street artist is sitting to the left of the first pillar shown.